The Newport Bay Conservancy (NBC) has been actively involved in watershed management and coordination for over 30 years and has actively promoted integrated, adaptive management (See Protecting Newport Bay Upstream published by NBC under its previous name in 2007). NBC was thrilled to have been awarded a grant from the California Department of Conservation that funded a Watershed Coordinator position within NBC for three years (2011-2014). The primary function of the position was to advance the holistic management of natural resources within the Newport Bay Watershed through a collaborative strategic planning process. The challenge of the Watershed Coordinator was to work with a vast number and hugely diverse group of entities towards a common strategic direction. 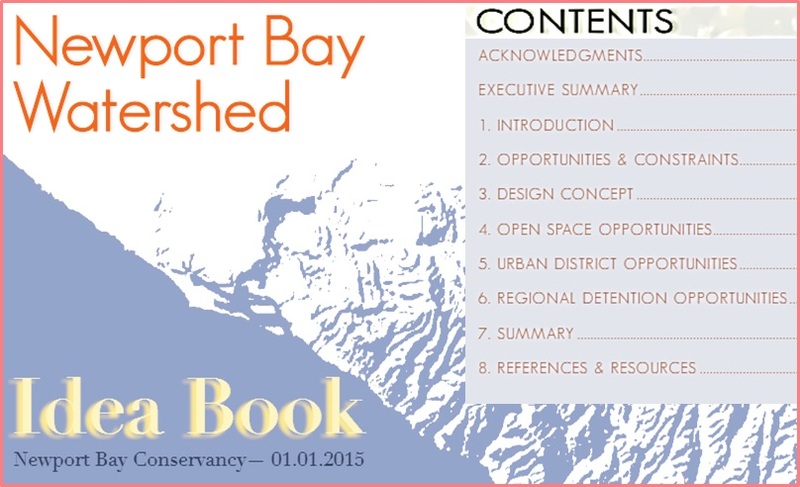 Through ongoing formal and informal process of refining and obtaining commitment from all stakeholders to the “Desired State”visioning statement for the Newport Bay Watershed. NBC has hired Krista Sloniowski (above, left) as the Watershed Coordinator. Krista is a full time consultant who previously held a position on NBC’s Board and also has been a Manager with the US Army Corps of Engineers and Boeing. Krista has her MPL in Urban Planning from USC. In the field of Urban Planning, normative scenario planning is a place-based visioning methodology that identifies a desired future outcome for a community, which is then used to inform a dialogue about the possible strategies for getting there. Through Krista’s work came the construction of an “Idea Book” which documents an experiment in the application to an urbanized ecological system. The specific ecological characteristics of a watershed determine the types of solutions that best integrate policy goals in that location. The opportunitiess identified in this Idea Book complement and integrate the many policy-driven natural resource management processes currently in place to create a scale of benefit much greater than the sum of its parts. The entire Idea Book can be downloaded at a lower resolution for viewing/reading (10 MB) or a higher resolution for printing (120MB). For more information, Krista can be reached by email, krista.sloniowski@newportbay.org.